This one-week trip to Moscow and St. Petersburg is great for first time visitors to Russia with departure dates throughout the year. Explore the cities in detail and travel between them by Red Arrow overnight train. Peterhof Palace - Discover the exquisite palace with its opulent decor and gardens with its cascading fountains. After checking in to our hotel in Moscow and meeting the rest of the group, there may be time to explore some of Russia's capital at our leisure. Moscow is one of the largest cities in the world. It has grown rapidly in recent decades, creating a sprawl of high-rise suburbs. However, its historic centre remains relatively compact, maintaining a great deal of its fascinating architecture. If you're booking your own flights then please ensure that you let us know whether you're arriving into Domodedovo International or Sheremetyevo International Airport so we can arrange your transfer accordingly. Moscow is the pivotal centre of Russia and there is much to see and do here. Rather than battle with the traffic on a bus tour, we will use the metro system to get around this morning - an experience in itself. Many of the stations are cavernous underground halls, elaborately decorated with chandeliers and we'll get to see the most iconic stations during our metro tour. Our metro tour will end in the famous Red Square, still paved in its original stones, where we can gaze in awe at the colourful onion-domes of Saint Basil's Cathedral. Surely one of the most remarkable architectural edifices in the world, Ivan the Terrible commissioned the work in the 16th century. Living up to his name, legend has it that he gorged out the eyes of its architect once completed, so that he could never again design a building of such brilliance. After the opportunity to grab some lunch in the famous GUM department store, we head to the outskirts of the city by bus, where we should get a great panoramic view of the city from the Lenin Hills. On our return to the city, we will pass Novodevichy Convent - a beautiful cloister that has remained intact since the 17th century and is now a UNESCO World Heritage Site. This evening, you may choose to experience Moscow's vibrant nightlife, which truly offers something for everyone. There are wine bars, blues bars, exceptional restaurants and classical concerts, to name just a few options. Your local guide will be able to offer you advice. This morning, we take the metro to the massive Moscow Kremlin - a city within a city. The triangular walls enclose an incredible complex of buildings, including three fine palaces, cathedrals, belfries and towers that represent Russia throughout its glorious past. Whilst here we visit the Armoury Museum, which contains a stunning collection of Imperial jewels and regalia. Included in this exhibit is the 16th century English silver sent to Ivan the Terrible by Queen Elizabeth I, with an eye towards securing matrimony. This afternoon is free to discover more of Russia's capital on your own. You may choose to visit the State Central Museum of Contemporary History, where you can gain a good insight into Russia from the beginning of the 19th century to the present day. Today has been left free for you to explore the many other sights Moscow has to offer. With the exception of holidays, Mondays and Fridays, you have the opportunity to visit Lenin's Mausoleum. Open between 10.00 and 13.00, entry is free, but there is often a bit of a queue. Other options include a visit to one of the many fine art galleries such as Tretyakova or the Bolshoi Theatre or to take a stroll in Gorky Park. Maybe you will revisit the impressive GUM department store, with its beautiful glass roof. If you're looking for something a bit different, then you could visit Muzeon Park, where you can view over 700 sculptures that have fallen from grace, including old Soviet statues that have been removed from Russia's main parks and squares. Alternatively, you might like to take an optional tour to Sergiev Posad - the beautiful monastery 60 kilometres from Moscow that is one of the most important pilgrimage sites in the country. This evening, we reunite to transfer to Moscow's main station to board our overnight train to St. Petersburg. We will be using the famous Red Arrow Train, which in Soviet times carried the Communist Party elite between Moscow and Leningrad (St. Petersburg) and has been operating since 1931. The train has been kept in its original style, so it's a unique experience and like taking a step back in time to an era when train travel was at its prime. Our accommodation is in four-berth compartments with bedding provided. The overnight train we plan to use for this holiday departs at 23.55 and arrives to St Petersburg at 07.55 the following day. On arrival this morning we'll have breakfast in a local restaurant and then head off for our tour of the city. Built on the hundred islets that form the delta of the Neva River, St. Petersburg (formerly Leningrad) was founded by Peter the Great as his 'Window on the West'. Regarded as one of the most beautiful and romantic cities in the world, its picturesque canals and baroque and neoclassical architecture give the city a European feel. St. Petersburg has always been a city of ideas and ideals. Not only was it the home of great writers such as Pushkin and Dostoyevsky, but it was here that the Russian Revolution began, and where, arguably, the first shoots of democracy sprouted, 70 years later. After arriving into the city by train, a guided coach tour will show us some of the highlights of this great city. We will take in Saint Isaac's Cathedral, Alexander Nevsky Convent, the Church of the Saviour of the Spilled Blood and Palace Square. Our afternoon is free to explore any of these places in more detail or alternatively, you may choose to relax before the opportunity to visit the ballet or opera this evening. We have some free time before our visit to the Hermitage Museum later in the morning. You may choose to visit the St Peter and Paul Fortress - the original 18th century citadel of St Petersburg. The Hermitage is unquestionably one of the finest art galleries in the world, containing the works of masters like Leonardo da Vinci, Titian, Raphael, Velázquez, Rubens and Rembrandt, as well as contemporary pieces by Matisse and Picasso. Collections are split between buildings, with much on display at the Winter Palace. The official residence of Russia's Tsars from the 18th century until Nicolas II's forced abdication in 1917, this monumental building contains no less than 1,500 rooms. Stormed by Red Army soldiers in a defining moment that marked the beginning of the Soviet era, the following month-long looting of the palace's wine cellars led to what some describe as 'the greatest hangover in history'. This afternoon is free to enjoy the city at your leisure. This morning we travel by bus to the Peterhof Palace and Gardens, which is often referred to as the Russian Versailles. The opulent palace is set within gardens filled with golden statues and elaborate fountains including the centre-piece of the Grande Cascade. The palace was originally built by Peter the Great, as his Grand Palace, and it was also much loved by his daughter Empress Elizabeth who expanded it and added the famed fountains. The Palace like most in Russia was unfortunately badly damaged by the invading Nazi soldiers during World War II, but it was one of the first to be restored and was reopened to the public fully by 1952. Please note that the fountains in the Peterhof Palace Gardens will only be working from May until October and they may be turned off earlier than this if the weather is too cold for them to operate without freezing. This afternoon is free for you to further explore St. Petersburg or you have the option to visit the Yusupov Palace where the 'mad monk' Rasputin was famously murdered. Our trip ends in St. Petersburg this morning, after breakfast. In European Russia snows usually start in November and stay till late March/early April, when a great thaw occurs with temperatures ranging from about 5°C in October and April to -15°C in January. Opera or ballet €50-150.00. This optional is subject to availability and performances may sell out. If there is a particular concert or venue you wish to visit, or you just want to ensure you're able to get a ticket to a performance, then we recommend booking your tickets online directly with the theatre production company before leaving the UK. 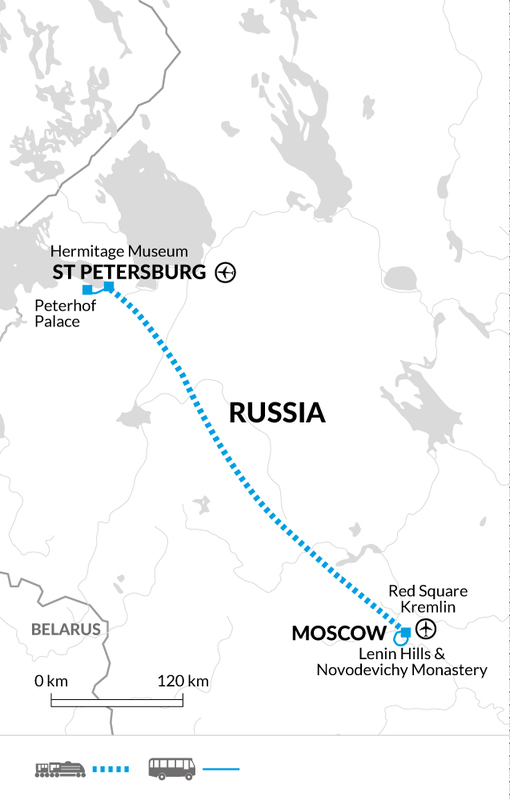 To get to the Bolshoi Theatre, take the metro from Partizanskaya station, travelling west on the dark blue line 5 stops to Ploshchad Revolyutsii. From here it is a short walk to the Bolshoi Theatre (less than 10 minutes) and is very clearly signposted. Visit to Sergiev Posad €35.00 (€40.00 for groups under 10). Concert of Maestro Borodiansky which usually held at Glazunov Museum €25-30.00. Please note this optional is subject to availability and your Explore Leader will advise of this on arrival. The cost shown here is just for the ticket to the concert and and museum/gallery entrance fee, transport will be paid for separately and locally. Saint Peter and Paul Fortress €25.00. Opera or ballet €40-180.00. This optional is subject to availability and performances may sell out. If there is a particular concert or venue you wish to visit, or you just want to ensure you're able to get a ticket to a performance, then we recommend booking your tickets online directly with the theatre production company before leaving the UK. Alexander Nevsky Lavra (Monastery) €5.00. Prices for the above optional trips include guide fee, entrance fee to the site and necessary transport unless it states otherwise. Pack a warm jumper, thermals, gloves, scarf, hat and a warm waterproof coat for trips in the winter. Layers work best as it will often be very warm inside buildings and on the overnight train, but much colder outside. July and August are the hottest months and lightweight cotton clothing is best. During spring and autumn temperatures can be lower or drop during the evenings and there is also a stronger possibility of rain, although light rainwear may be needed at any time of year. A warm fleece/jacket is recommended for cooler evenings. Ladies should take a headscarf and ensure their shoulders are covered when entering churches. We recommend taking comfortable walking shoes for exploring and trainers or sandals for relaxing. During winter, conditions maybe icy or snowy so we recommend taking warm boots with good grip. One main piece of luggage and a daysac for personal items. Spare camera batteries can be useful as these do not last long in cold weather. A torch is useful in case of powercuts/ emergencies. You should allow approximately 20 Euros for tips. We recommend that you take your money in Euros or US Dollars cash. For US Dollars notes should be in good condition (not torn or marked), issued after 1990 (pre-1990 are often refused) and ideally in small denominations. Euros and Dollars are easily transferable into the local currency, Roubles. Local currency (Russian Roubles) can also be drawn on credit cards from ATM's in both Moscow and St Petersburg. For the overnight train journey we will use sleeper carriages with four bunk beds with bedding provided (two beds on floor level and two above) per compartment and with a shared toilet and wash basin in each carriage. There are no shower facilities on board. Luggage is stored under the bottom bunk beds and above the cabin door for the top bunks. There is the possibility that you will be sharing with non-Explore clients in the same cabin. There is no air-conditioning on board and it's not always possible to open the windows, so we recommend light weight bed clothes. You can experience authentic rail travel with the local people and it's a great way of getting from place to place during the night, so you maximise on the amount of time you have in each city during the day to explore. Take snacks, drinks, toilet roll, hand sanitiser and an open mind with you for maximum enjoyment. We will be using the famous Red Arrow Train, which in Soviet times carried the Communist Party elite between Moscow and Leningrad (St. Petersburg) and has been operating since 1931. The train has been kept in its original style, so it's a unique experience for us and like taking a step back in time to an era when train travel was at its prime. In Russia the majority of buildings including the hotels still use the old Soviet District Heating System. Large power plants supply both electricity and hot water and from autumn to spring the central heating provided is at a set temperature, which can't be individually adjusted. So this means that it can be hotter inside the hotel bedrooms than you'd expect, but this can't be turned down, so it's best to open a window if you are too warm. Most of the hotels in the main cities were constructed during Soviet times and so tend to be large and can have ostentatious decor. The hotels we use in both Moscow and St. Petersburg are in this style and are just a short journey by metro from the city centres. In Moscow our hotel is by Partizanskaya metro station and is approximately 15 minutes from the Red Square. Within walking distance of our hotel is the Kremlin in Izmailovo where you can visit a number of museums and see different Russian architectural styles. Here you'll find the Russian Toys Museum, Russian Fleet Museum and the Russian Vodka History Museum. Next door to here is a flea market and the Vernissage where folk crafts and antiques are on sale. Nearby there's also Izmailovsky Island surrounded by the Serebryano-Vinogradnye ponds. The island contains 18-19th centuries architectural monuments and was created by the second Tsar of the Romanov family. One of the largest city parks in Europe, Izmailovo Park, is also close by. In St. Petersburg our hotel is situated near to Nevsky Prospekt on the Neva River embankment. The metro station is in the hotel building and it takes approximately 20 minutes to reach the Hermitage. Within walking distance of our hotel is Alexander Nevsky Lavra. This monastery complex is home to some of the oldest buildings in the city and the graves of some of Russia's most famous composers and writers including Tchaikovsky, Dostoevsky and Glinka. Russia: All nationalities require a single entry visa in order to enter Russia. As part of the visa requirements you will need to obtain a Russian Travel Voucher and Authorisation from the local Russian authorities. Explore will request this on your behalf approximately 8 weeks prior to departure. Please allow a minimum of 5 working days for the travel voucher and authorisation to be processed. Due to the visa processing times, Explore are unable to accept bookings within one month of travel. It is essential that you provide Explore with the correct passport information at the time of booking, as this will be required in order to request the travel voucher and letter of invite, as well as pre-book any applicable train tickets. Corrections and amendments will incur additional charges, so please double check that the information we have for you is up to date and correct, this includes your passport number, full name as per passport (including middle names), date of birth and place of birth; if customers renew or reissue their passports from the details initially given to Explore, train tickets must be cancelled and purchased again, which involves extra costs and may result in customers being in differing train carriages to the rest of the group. If you intend to renew your passport please let Explore know at the point of booking and please ensure that you have the new passport no later than 8 weeks prior to travel. You will be required to enter a reference number and a confirmation number on your visa application. These can be found at the top of your authorisation letter under the heading 'Voucher Number'. The 6 digit long number is the reference and the 4 digit number is the confirmation number. In order for Explore to provide the necessary documentation to support your visa application (i.e. your visa authorisation), all pre and post tour accommodation must be booked through Explore and not booked independently. Please ensure that your passport has a minimum of 6 months validity from the date of return to your home country. All visa information is subject to change regularly, so please check with your local consulate for the most up to date advice for the countries you are visiting. All other nationalities should check with the Russian embassy. For nationalities that require proof of their travel insurance through Explore as part of their visa application, please contact us for a copy of this. Please note for many attractions and sites you visit during the tour, you will not be allowed to take coats or bags inside. These will have to be checked into the cloakrooms available and so customers are advised to carry a small bag for wallets/purses, mobile phone, personal docs etc in whilst inside the venue. For those travelling in winter please be aware that a number of statues are boxed up every year, however at this time of year you will benefit from far fewer tourists visiting the cities. Nothing compulsory, but we recommend protection against tetanus, typhoid, hepatitis A, polio and diphtheria. Tick-borne encephalitis is recommended by some medical sources if travelling in certain areas of Eastern Europe, at specific times of the year. Please check the latest requirements with your travel clinic or doctor prior to departure. The above is not an exhaustive list. Further information regarding vaccinations and travel health advice can be found by following the NHS and NaTHNaC links at Explore Travel Health and from your local healthcare provider. Visa and vaccination requirements are subject to change and should be confirmed by you before travelling. The Russian government advises that certain medications must be declared upon entry into the country, and you may also be required to carry a prescription with you. You should consult your local consulate for up to date information prior to travel.